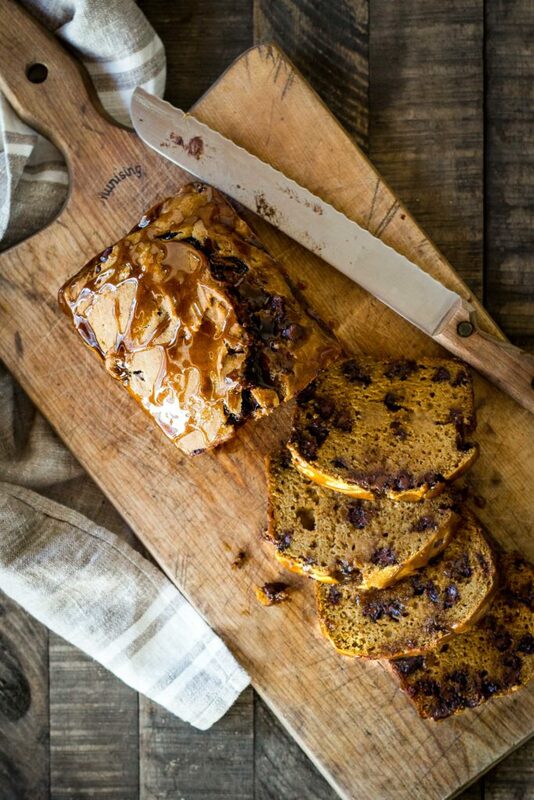 Early mornings sipping coffee and nibbling on a piece of thickly sliced pumpkin bread is the best part of autumn. It’s quickly gotten cold here and the past few mornings we’ve gotten some heavy frosts. Since we’re not able to harvest the veggies until the temperature rises and the greens are no longer frozen, our days are starting a little later than usual– which is fine by us! Now that we’re not so rushed in the morning our breakfasts have been a mix of scrambled eggs and bacon or sweet quick breads and muffins. This particular bread is a little more indulgent than most of my baked goods (I mean there’s chocolate and bourbon involved!) but I’m okay with that every now and again. This loaf is a great treat this time of the year and I’m so happy with how moist and delicious it turned out. I roasted a sugar pumpkin a few days ago and used the puree in this recipe but I’m guessing canned pumpkin will work just fine too if you’re in a pinch. And not to worry if bourbon isn’t your thing, you can easily leave it out of the glaze. This bread tastes great for breakfast or a tasty dessert after dinner. I hope you all enjoy this as much as we do. Pour a cup of coffee and dig in! Preheat the oven to 325F and place a rack in the center of the oven. Grease a 9 by 5 inch loaf pan and set it to the side. In a large bowl beat the oil and honey together. Add the eggs and whisk until blended. Stir in the pumpkin, milk, spices, salt, baking soda and vanilla. Whisk until well incorporated. Add the flour and use a wooden spoon to stir until just incorporated. Gently fold in the chocolate chips and then pour the batter into your prepared loaf pan. Bake in the oven until golden brown and a toothpick comes out clean when inserted in the middle. About 55 minutes. Start checking your bread around the 50 minute mark. Remove the bread from the oven and allow it to cool for about 15 minutes before preparing your glaze. Heat a small saucepan over medium high heat. Add the butter, brown sugar, milk, vanilla extract and bourbon. Bring it to a low boil, stirring constantly (so it doesn't burn). Reduce the heat to medium and simmer, stirring often, until the mixture has thickened up a bit. About 2-3 minutes. I think substituting with brown sugar would work just fine! Let me know how it turns out! I just made this delicious bread, and it was a huge hit! I substituted maple syrup for honey and was too eager to cut into it to make the bourbon glaze. Thanks for another wonderful recipe, Andrea! Will almond flour work here instead of grain? Same amount? Unfortunately it will not convert to the same measurements here. can bread flour be used in place of the whole wheat flour using same measurements? What about unbleached all purpose flour, same measurements all around?? This bread looks lovely. Can’t wait to make it this fall! Your blog is a treasure!